W. H. Parkinson [plaintiff] v. J. F. Hobkirk. Plaintiff sued defendant for £25, money advanced by plaintiff. Mr. Green (of Miller and Green) appeared for plaintiff, and Mr. Douglas for defendant. Jury-Messrs. J. At. M. Mackinnon, J. H. Smith, James Peter, and Wm. Hill. 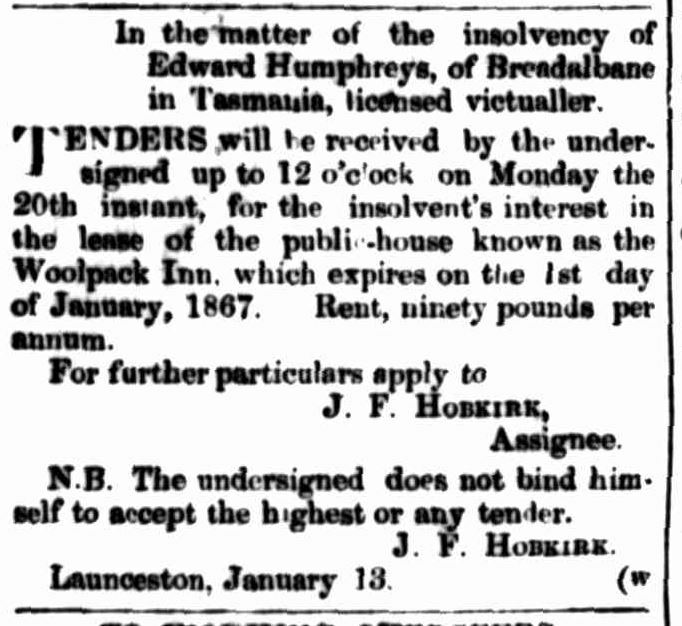 The evidence in this case was to this effect –Towards the close of last year Mr. E. Humphreys, the occupier of the Woolpack Inn, Breadalbane, of which plaintiff was the owner, became insolvent, and the interest of the house (for which the licence fee had not been paid by Humphreys) of course passed into the hands of the assignee (defendant). With a view to benefit the plaintiff, defendant called upon him and told him that Humphreys was insolvent and was unable to pay the licence fee, and that if he (plaintiff) would promise to pay the licence fee by the 1st of December, he (defendant) would keep the house open until another tenant was found; but if the fee was not promised the house would be closed at once. Plaintiff promised and eventually paid the £25, which, with the amount (£10) realised by the sale of the goodwill of the house to the incoming tenant, Mr. Hanney, who took possession on the 3rd of February, were placed to the credit of the estate. Mrs Leith (of the Pinces of Wales Inn, Carrick) and Mr W. Parkinson (of the Woolpack Inn, Breadalbane), were granted permission to keep their licensed houses open until midnight to-morrow night. The Woolpack Inn, Breadalbane, granted to the late Mr William Henry Parkinson; application from Mr W. Saltmarsh. Mr Coulter said that applicant had been allowed, by the justices in petty session, permission to sell liquors at the Woolpack Inn for the executors to Mr Parkinson’s estate— Messrs. W. Hartnoll and J. Hyrons. District-constable Murphy said that Chief District-constable Propsting was absent on duty, but he did not know anything of the character of the applicant, and bad written to Mr Perkins, Superintendent of Police at Longford, who re plied that Mr Saltmarsh had applied at the annual licensing meeting at Long ford, in December 1866, for a license, and had been refused on the ground of character, for drunkenness, but that since then he had conducted himself well, and when steady was well adapted to conduct a public-house, and so was Mrs Saltmarsh. Mr Coulter said that the executors were in court, and they approved of the applicant. District-constable Murphy, in reply to Mr Cohen, said that during the two months Mr Saltmarsh had been con ducting the Woolpack Inn, there had been no complaints against him, and the police in the locality spoke highly of Mr Saltmarsh. Mr Aikenhead proposed that Mr Salt marsh be allowed to have a license, with a caution. Mr Saltmarsh said he had conducted a licenced house for twenty years at Longford without any complaints having been made against him. The Chairman said the application was granted, but with a recommendation from the Bench to Mr Saltmarsh to be cautious. General Sessions.— An adjourned Court of General Sessions was held at the Recorder’s Chambers, on Monday morning; present— J.Whitefoord, Esq. (Chairman); Thomas Mason Esq., P.M.; James Aikenhead, Henry Bennett, A. F. J. Bowen, John Crookes, and Robert DeLittle, Esquires, Justices of the Peace. Mr Smith, as Clerk of the Peace, said he had only received notice of one appeal, from Mr Richard Barker, and that had not been sent in time. Mr Mason said the ground of appeal in this case was that Mr Barker, who had kept the Albion Inn at Breadalbane, had purchased the Woolpack Inn since the decease of Mr Parkinson, shut up the Albion Inn, and now appealed and applied for a reduction of assessment, on the grounds that the Albion was no longer a public-house. The appeal, however, had been received too late, and if it had not it would have been inadmissible, as no alteration had been made In the amount of assessment at the last revision. The Chairman said in reality there was no business whatever before the Court, and it then rose. QUARTERLY LICENSING MEETING. 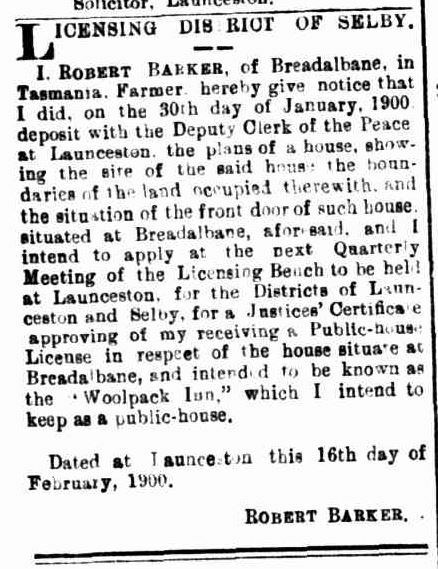 LAUNCESTON–At the Quarterly Licensing Meeting held on Monday morning at the Court house here, the only business done was to sanction the transfer of the license to the Woolpack Inn, from Mr Barker to Mr Richard Chugg. A QUARTERLY LICENSING MEETING was held at the Court House yesterday. . Present–John Whitefoord, Esq. (Chairman), James Aikenhead, Esq., Henry Bennett, Esq., and John Thomson, Esq., J’s. 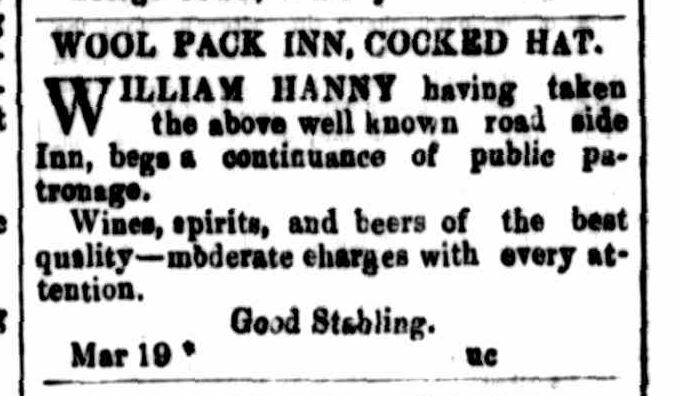 P. The only application to be heard was that for a transfer of the licence to the house known as the Woolpack Inn, Breadalbane, from Mr Henry Churgg to Mr Richard Chugg. The application was granted. 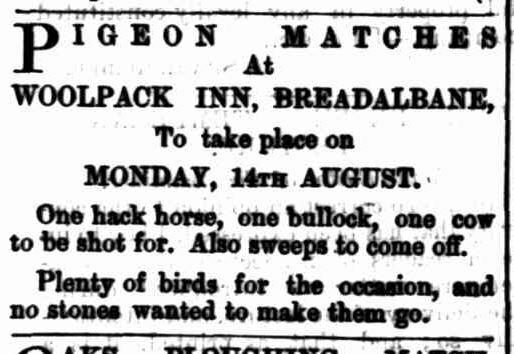 Outrage at Breadalbane.— Shortly after midnight on Sunday night, or rather Monday morning, some rowdy characters knocked at the door of the Woolpack Inn, Breadalbane, demanding admission. As Mr Barton did not feel disposed to open his house at that hour, the midnight disturbers of the peace fired a volley of stones at the windows, smashing seven squares of glass, arid then ran away: Mr Barton offers a reward of £5 for such information as will lead to the conviction of the offenders. Philip Davis applied for a transfer of the license of the Woolpack Inn, Breadalbane, held by Mrs Elizabeth Barton. Mr O. D. C. Propsting stated that the applicant had recently married Mrs Barton. Davis was. a respectable man, and he knew nothing against his character. The transfer was granted. Geo. Laird applied for a transfer of the license from Chas. Lansdell, of the Woolpack Inn, Breadalbane. There being.no objection to the application it was granted. An application was made by Mr Richard Barker for the transfer of a license of the Woolpack Inn) Breadalbane, from Mr George Laird. Superintendent Propsting stated there was no police objection, and the application was granted. 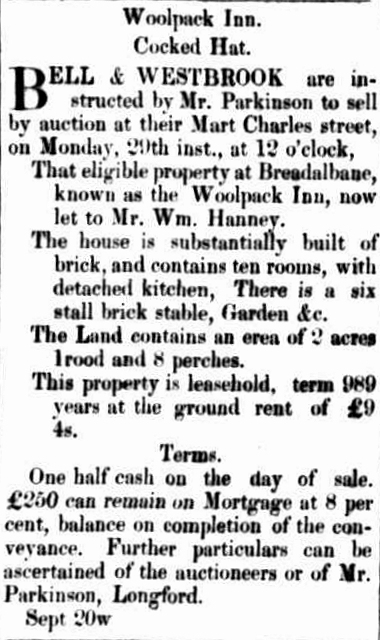 The plans of a house at Breadalbane, to be called the Woolpack Inn, were tabled by Robert Barker. An application for a new license [by Robert Barker] for premises at Breadalbane formerly known as the Woolpack Inn was withdrawn. Plans were handed in of an old house (Woolpack Inn) at Breadalbane, and an hotel to be erected in George-street by J. Tait. Robert Barker applied for a new license for the Woolpack Inn at Breadalbane. and asked that that Bench recommend the reduction of the fee to £12 10s. Mr T. Shields (instructed by Mr J. H. Keating) appeared for the applicant. Superintendent Driscoll said the police did not object to the license. The house had ample accommodation. Mr Shields pointed out, that the hotel was formerly kept by Mr Barker, but had not been licensed for some time. It was just within four miles from the Perth Hotel ; in fact, only 22 yards 9 inches short of the distance required by the Act. All the other requirements for a reduced fee fell within the provisions of the section. The applicant was prepared to pay the full fee, but asked that the Bench recommend to the Treasurer a remission of half the money. The Chairman : We have no power in the matter. It will be for Barker to apply to the Treasurer for a remission of half the fee. The Bench granted the application for the license, but made no recommendation as to the remission. The application of J. M. Murphy in respect of a public-house license for the Woolpack Inn at Breadalbane, was opposed by the police on the ground that it was not required in the locality. Sir. T. W. Maloney appeared on behalf of the applicant. After hearing evidence on both sides, tho Court refused the application on the ground that they considered the house was not required. Breadalbane in the 30’s and 40’s of last century was a notorious district, and the two inns of the day, near the junction of the Hobart highway with the road to Evandale, had a reputation linked with bush rangers and sheep stealers. The Woolpack Inn, earlier known as the Breadalbane Coffee House, was built in the late 30’s on land granted in 1838 to Thomas Scott, one of Van Diemen’s Land’s earliest settlers. He was a land surveyor from County Barwick, Scotland, and he apparently conceived Breadalbane as the site for a big township. He sub divided much of his 584 acres and named the area the Cocked Hat Hill Estate. Some he leased in 1853 to Samuel Page, who was also an early pioneer and one of the founders of the establishment of coaches which con ducted a service between Launces ton and Hobart. Mr. Page was a member of the family of that name which played a prominent part both in coaching and racing days of early Tasmania. 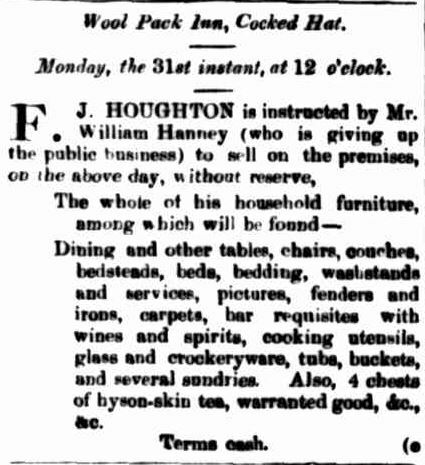 History records that the Woolpack Inn was more than once a hide-out for bushrangers. Sheep stealers made it their headquarters too. On one occasion a nearby pigsty was found to have a false floor and beneath was quite a large space in which stolen sheep were found. Coaches to and from Launceston called at the Woolpack Inn and the nearby Albion Inn, while horses were watered at a handy waterhole. The Woolpack Inn was licensed as an hotel until 1920. The property remained in the Scott family until recently, when it was bought by Mr. and Mrs. M. L. Smith. Mr. Smith, a former hotelkeeper in Launceston, plans to remodel the existing structure, the convict-made bricks of which are in excellent condition. Mr. Smith plans to build a new frontage in concrete and brick and to make extensive alterations and additions to provide an hotel with 16 bedrooms, private and public lounges and bar. An application for a provisional certificate for a license will be made by Mr. Smith to the Evandale Licensing Court on November 29. This entry was posted in Breadalbane/Springs, Hotel and tagged location, no photo by Xenith. Bookmark the permalink.